From Atoms to Bits: Opportunity or Threat? This is “From Atoms to Bits: Opportunity or Threat?”, section 3.3 from the book Getting the Most Out of Information Systems: A Manager's Guide (v. 1.0). For details on it (including licensing), click here. 3.3 From Atoms to Bits: Opportunity or Threat? Understand the shift from atoms to bits, and how this is impacting a wide range of industries. Recognize the various key issues holding back streaming video models. Know the methods that Netflix is using to attempt to counteract these challenges. Nicholas Negroponte, the former head of MIT’s Media Lab, wrote a now classic essay on the shift from atoms to bitsThe idea that many media products are sold in containers (physical products, or atoms) for bits (the ones and zeros that make up a video file, song, or layout of a book). As the Internet offers fast wireless delivery to TVs, music players, book readers, and other devices, the “atoms” of the container aren’t necessary. Physical inventory is eliminated, offering great cost savings.. Negroponte pointed out that most media products are created as bits—digital files of ones and zeros that begin their life on a computer. Music, movies, books, and newspapers are all created using digital technology. When we buy a CD, DVD, or even a “dead tree” book or newspaper, we’re buying physical atoms that are simply a container for the bits that were created in software—a sound mixer, a video editor, or a word processor. The shift from atoms to bits is realigning nearly every media industry. Newspapers struggle as readership migrates online and once-lucrative classified ads and job listings shift to the bits-based businesses of Craigslist, Monster.com, and LinkedIn. Apple dominates music sales, selling not a single “atom” of physical CDs, while most of the atom-selling “record store” chains of a decade ago are bankrupt. Amazon has even begun delivering digital books, developing the Kindle digital reader. Who needs to kill a tree, spill ink, fill a warehouse, and roll a gas-guzzling truck to get you a book? Kindle can slurp your purchases through the air and display them on a device lighter than any college textbook. When Amazon CEO Bezos unveiled the Kindle DX at a press event at Pace University in Spring 2009, he indicated that Kindle book sales were accounting for 35 percent of sales for the two hundred and seventy-five thousand titles available for the deviceA. Penenberg, “Amazon Taps Its Inner Apple,” Fast Company, July 1, 2009.—a jaw-dropping impact for a device many had thought to be an expensive, niche product for gadget lovers. Video is already going digital, but Netflix became a profitable business by handling the atoms of DVDs. The question is, will the atoms to bits shift crush Netflix and render it as irrelevant as Hastings did Blockbuster? Or can Reed pull off yet another victory and recast his firm for the day that DVDs disappear? Concerns over the death of the DVD and the relentless arrival of new competitors are probably the main cause for Netflix’s stock volatility these past few years. Through 2009, the firm’s growth, revenue, and profit graphs all go up and to the right, but the stock has experienced wild swings as pundits have mostly guessed wrong about the firm’s imminent demise (one well-known Silicon Valley venture capitalist even referred to the firm as “an ice cube in the sun,”M. Copeland, “Netflix Lives! Video Downloads Haven’t Made the DVD-by-Mail Business Obsolete,” Fortune, April 21, 2008. a statement Netflix countered with four years of record-breaking growth and profits). The troughs on the Netflix stock graph have proven great investment opportunities for the savvy. NFLX was up some 40 percent for the first half of 2009, a time when the sub-prime crisis hammered major exchanges. The firm continued to enjoy its most successful quarters as a public company, and subscriber growth rose even as DVD sales fall. But even the most bullish investor knows there’s no stopping the inevitable shift from atoms to bits, and the firm’s share price swings continue. When the DVD dies, the high-tech shipping and handling infrastructure that Netflix has relentlessly built will be rendered worthless. Reed Hastings clearly knows this, and he has a plan. “We named the company Netflix for a reason; we didn’t name it DVDs-by-mail.”M. Boyle, “Questions for…Reed Hastings,” Fortune, May 23, 2007. But he also prepared the public for a first-cut service that was something less than we’d expect from the long tail poster child. When speaking about the launch of the firm’s Internet video streaming offering in January 2007, Hastings said it would be “underwhelming.” The two biggest limitations of this initial service? As we’ll see below, not enough content, and figuring out how to squirt the bits to a television. First the content. Two years after the launch of Netflix streaming option (enabled via a “Watch Now” button next to movies that can be viewed online), only 12,000 videos were offered, just 12 percent of the firm’s long tail. And not the best 12 percent. Why so few titles? It’s not just studio reluctance or fear of piracy. There are often complicated legal issues involved in securing the digital distribution rights for all of the content that makes up a movie. Music, archival footage, and performer rights may all hold up a title from being available under “Watch Now.” The 2007 Writers Guild strike occurred largely due to negotiations over digital distribution, showing just how troublesome these issues can be. Add to that the exclusivity contracts negotiated by key channels, in particular the so-called “premium” television networks. Film studios release their work in a system called windowingIndustry practice whereby content (usually a motion picture) is available to a given distribution channel for a specified time period or “window,” usually under a different revenue model (e.g., ticket sale, purchase, license fee).. Content is available to a given distribution channel (in theaters, through hospitality channels like hotels and airlines, on DVD, via pay-per-view, via pay cable, then broadcast commercial TV) for a specified time window, usually under a different revenue model (ticket sales, disc sales, license fees for broadcast). Pay television channels in particular have negotiated exclusive access to content as they strive to differentiate themselves from one another. This exclusivity means that even when a title becomes available for streaming by Netflix, it may disappear when a pay TV window opens up. If HBO or Showtime has an exclusive for a film, it’s pulled from the Netflix streaming service until the exclusive pay TV time window closes. A 2008 partnership with the Starz network helped provide access to some content locked up inside pay television windows, and deals with Disney and CBS allow for streaming of current-season shows.S. Portnoy, “Netflix News: Starz Catalog Added to Online Service, Streaming to PS3, Xbox 360 through PlayOn Beta Software,” ZDNet, October 2, 2008, http://blogs.zdnet.com/home-theater/?p=120. But the firm still has a long way to go before the streaming tail seems comparably long when compared against its disc inventory. And there’s also the influence of the king of DVD sales: Wal-Mart. 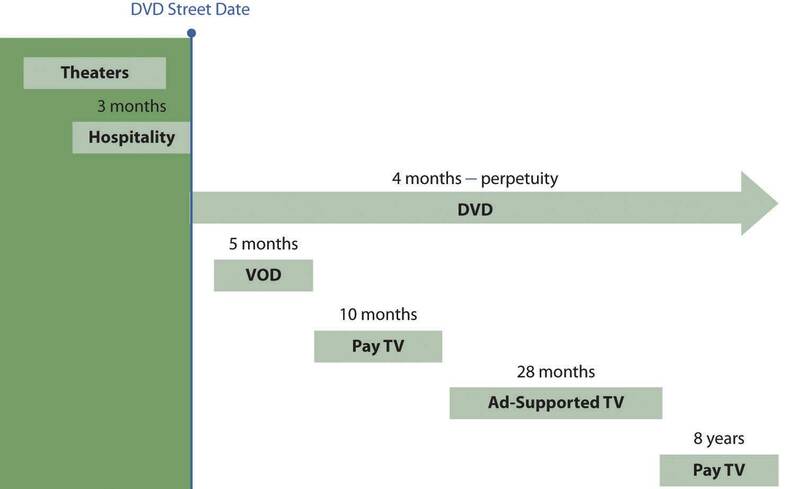 The firm accounts for about 40 percent of DVD sales—a scale that delivers a lot of the bargaining power it has used to “encourage” studios to hold content from competing windows or to limit offering titles at competitive pricing during the peak new release DVD period.R. Grover, “Wal-Mart and Apple Battle for Turf,” BusinessWeek, August 31, 2006. Taken together it’s clear that shifting the long tail from atoms to bits will be significantly more difficult than buying DVDs and stacking them in a remote warehouse. But How Does It Get to the TV? The other major problem lies in getting content to the place where most consumers want to watch it: the living room TV. Netflix’s “Watch Now” button first worked only on Windows PCs. Although the service was introduced in January 2007, the months before were fueled with speculation that the firm would partner with TiVo. Just one month later, TiVo announced its partner—Amazon.com. At that point Netflix found itself up against a host of rivals that all had a path to the television: Apple had its own hardware solution in Apple TV (not to mention the iPod and iPhone for portable viewing), the cable companies delivered OnDemand through their set-top boxes, and now Amazon had TiVo. An internal team at Netflix developed a prototype set top box that Hastings himself supported offering. But most customers aren’t enthusiastic about purchasing yet another box for their set top, the consumer electronics business is brutally competitive, and selling hardware would introduce an entirely new set of inventory, engineering, marketing, distribution, and competitive complexities. The solution Netflix eventually settled on was to think beyond one hardware alternative and instead recruit others to provide a wealth of choice. The firm developed a software platform and makes this available to firms seeking to build Netflix access into their devices. Today Netflix streaming is baked into televisions and DVD players from LG, Samsung, Sony, and Vizio, among others. It’s also available on all major video game consoles—either as a direct feature or third-party software add-on. Even TiVo now streams Netflix. And that internally developed Netflix set-top box? The group was spun out to form Roku, an independent firm that launched their own $99 Netflix streamer. The switch to Blu-ray DVDs may offer the most promise. Blu-ray players are on the fast track to commoditization. If consumer electronics firms incorporate Netflix access into their players as a way to attract more customers with an additional, differentiating feature, Hastings’s firm could end up with more living room access than either Amazon or Apple. There are seventy-three million households in the United States that have a DVD player and an Internet connection. Should a large portion of these homes end up with a Netflix-ready Blu-ray player, Hastings will have built himself an enviable base through which to grow the video streaming business. Who’s going to win the race for delivering bits to the television is still very much an uncertain bet. The models all vary significantly. Apple’s early efforts were limited, with the firm offering only video purchases for Apple TV, but eventually moving to online “rentals” that can also play on iPods. Movie studios are now all in Apple’s camp, although the firm did temporarily lose NBC’s television content in a dispute over pricing. Amazon and Microsoft also have online rentals and purchase services, and can get their content to the television via TiVo and XBox, respectively (yes, this makes Microsoft both a partner and a sort of competitor, a phenomenon often referred to as coopetitionWhen firms find themselves in situations where they are both competitors and collaborators, or “frenemies.” Technology is increasingly redefining products, pushing the boundaries of delivery channels, and creating situations where firms often find themselves in these collaborative/rival relationships., or frenemiesA. Brandenberger and B. Nalebuff, Co-Opetition: A Revolution Mindset That Combines Competition and Cooperation: The Game Theory Strategy That’s Changing the Game of Business (New York: Broadway Business, 1997); and S. Johnson, “The Frenemy Business Relationship,” Fast Company, November 25, 2008.). Hulu, a joint venture backed by NBC, Fox, and other networks, is free, earning money from ads that run like TV commercials. While Hulu has also received glowing reviews, the venture has lagged in offering a method to get streaming content to the television. Netflix pioneered “all-you-can-eat” subscription streaming. Anyone who has at least the $8.99 subscription plan can view an unlimited amount of video streams. And Blockbuster isn’t dead yet. It also streams over TiVo and has other offerings in the works. There’s a clear upside to the model when it shifts to streaming; it will eliminate a huge chunk of costs associated with shipping and handling. Postage represents one-third of the firm’s expenses. A round-trip DVD mailing, even at the deep discounts Netflix receives from the U.S. Postal Service, runs about eighty cents. The bandwidth and handling costs to send bits to a TV set are around a nickel.B. McCarthy, “Netflix, Inc.” (remarks, J. P. Morgan Global Technology, Media, and Telecom Conference, Boston, May 18, 2009). At some point, if postage goes away, Netflix may be in a position to offer even greater profits to its studio suppliers, and to make more money itself, too. Wrangling licensing costs presents a further challenge. Estimates peg Netflix 2009 streaming costs at about one hundred million dollars, up 250 percent in three years. But these expenses still deliver just a fraction of the long tail. Streaming licensing deals are tricky because they’re so inconsistent even when titles are available. Rates vary, with some offered via a flat rate for unlimited streams, a per-stream rate, a rate for a given number of streams, and various permutations in between. Some vendors have been asking as much as four dollars per stream for more valuable contentD. Rayburn, “Netflix Streaming Costs,” Streaming Media, June/July 2009.—a fee that would quickly erase subscriber profits, making any such titles too costly to add to the firm’s library. Remember, Netflix doesn’t charge more for streaming—it’s built into the price of its flat-rate subscriptions. Any extra spending doesn’t come at the best time. The switch to Blu-ray DVDs means that Netflix will be forced into the costly proposition of carrying two sets of video inventory: standard and high-def. Direct profits may not be the driver. Rather, the service may be a feature that attracts new customers to the firm and helps prevent subscriber flight to rival video-on-demand efforts. The stealth arrival of a Netflix set-top box, in the form of upgraded Blu-ray DVD players, might open even more customer acquisition opportunities to the firm. Bought a Blu-ray player? For just nine dollars per month you can get a ticket to the all-you-can-eat Netflix buffet. And more customers ready to watch content streamed by Netflix may prime the pump for studios to become more aggressive in licensing more of their content. Many TV networks and movie studios are leery of losing bargaining power to a dominant firm, having witnessed how Apple now dictates pricing terms to music labels. The good will Netflix has earned over the years may pay off if it can become the studios’ partner of first choice. While one day the firm will lose the investment in its warehouse infrastructure, nearly all assets have a limited lifespan. That’s why corporations depreciate assets, writing their value down over time. The reality is that the shift from atoms to bits won’t flick on like a light switch; it will be a hybrid transition that takes place over several years. If the firm can grab long-tail content, grow its customer base, and lock them in with the switching costs created by Cinematch (all big “ifs”), it just might emerge as a key player in a bits-only world. Is the hybrid strategy a dangerous straddling gambit or a clever ploy to remain dominant? Netflix really doesn’t have a choice but to try. Hastings already has a long history as one of the savviest strategic thinkers in tech. As the networks say, stay tuned! The shift from atoms to bits is impacting all media industries, particularly those relying on print, video, and music content. Content creators, middlemen, retailers, consumers, and consumer electronics firms are all impacted. Netflix’s shift to a streaming model (from atoms to bits) is limited by access to content and in methods to get this content to televisions. Windowing and other licensing issues limit available content, and inconsistencies in licensing rates make profitable content acquisitions a challenge. What do you believe are the most significant long-term threats to Netflix? How is Netflix trying to address these threats? What obstacles does the firm face in dealing with these threats? Who are the rivals to Netflix’s “Watch Now” effort? Do any of these firms have advantages that Netflix lacks? What are these advantages? Why would a manufacturer of DVD players be motivated to offer the Netflix “Watch Now” feature in its products? Describe various revenue models available as video content shifts from atoms to bits. What are the advantages and disadvantages to each—for consumers, for studios, for middlemen like television networks and Netflix? Wal-Mart backed out of the DVD-by-mail industry. Why does the firm continue to have so much influence with the major film studios? What strategic asset is Wal-Mart leveraging? Investigate the firm Red Box. Do you think they are a legitimate threat to Netflix? Why or why not?